The 10 Best Florists in Wisconsin! From weddings, school dances, Valentine’s Day, other special occasions, or just because—flowers have always been an important part of our culture. Flowers are a way to show someone you care and these Wisconsin florists have blossomed in more ways than one. Check out our favorite flower shops closest to you! Red Square Flowers are located off of Mifflin Street right in down town Madison. They offer unique floral arrangements for all types of events. They even offer floral classes that can teach you the art of floral design for a DIY type situation for the future. Check out their 24/7 delivery options as well. Order today and catch their same day delivery of fresh flowers in the Waukesha area. Order and shop online at any time of the day. They have great gifts and pre-arranged options for the pickiest of people. Also, if you aren’t gifted with the greenest of thumbs—check out their Planting and Potting Tips page. House of Flowers is a locally-owned floral business in Oshkosh. Shop by occasion or shop just because—the helpful staff at House of Flowers will be sure to find you a perfect arrangement for your occasion. Be sure to ask about their featured collections and check out what’s currently in bloom! Felly’s Flowers is a Madison favorite. They have tons of store located throughout Madison making it easy for everyone to shop and for your arrangements to be delivered in a timely manner. They have a great online selection where you can refine your results by occasion, price, and what’s in season. Enjoy the upscale full service at Urban Sense located in Milwaukee’s Washington Heights neighborhood. You will find European floral dessins, fresh cuts, quirky gifts, and of course the ever so trendy succulents. Let Urban Sense make your occasion a special one. Enjoy same day deliveries from Alfa Flower Shop in Milwaukee. For over 67 years they have been a trusted floral provider to all the Milwaukee Metro areas. 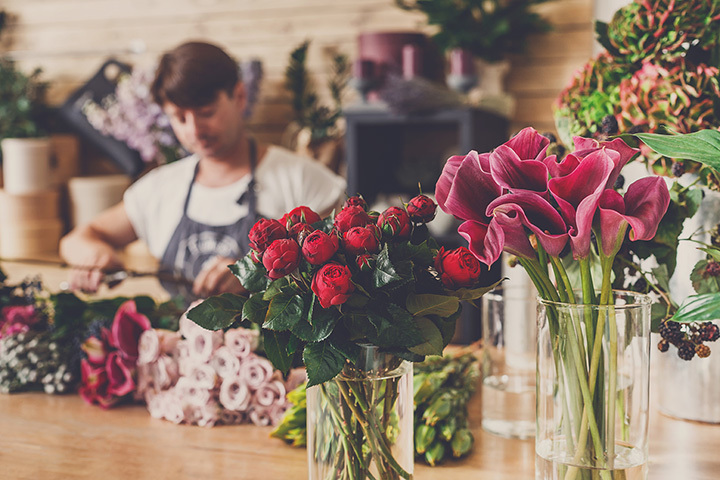 From staying up to date on the latest trends to giving you the customer service you are looking for in a florist, Alfa Flower Shop is there for you. Georges Flowers offers a third-generation floral experience. They are conveniently located in Madison, offer and great online selection, and offer great recommendations for you recipient. Your satisfaction in guaranteed when you shop at George’s Flowers on Park Street. At Pesche’s Green House and Floral Shop, browse their larges selections of floral designs, gifts, cacti, tropical plants, annuals, and perennials. Step on site to see their 20 plus green houses on their 10 acres with a completed garden center. Pesche’s is a one stop shop when shopping for floral décor around your house or for buying gifts for others. Gain some peace of mind by safety and securely ordering floral arrangements online at Sunshine Floral. If you are in the La Crosse area and looking for a top-notch florist—Sunshine is the place to be. You won’t be disappointed in the quality and the price of your arrangements when they’re delivered to your loved ones. The Rose Cottage in Maddison, Wisconsin, fills our last slot on our list due to free, same day shipping—yes you heard that right. Not only are you receiving stunning flower arrangements but they are backed by a 100 percent satisfaction guarantee. Become one of the thousand satisfied customers in the area who choose Rose Cottage time after time for their floral needs.